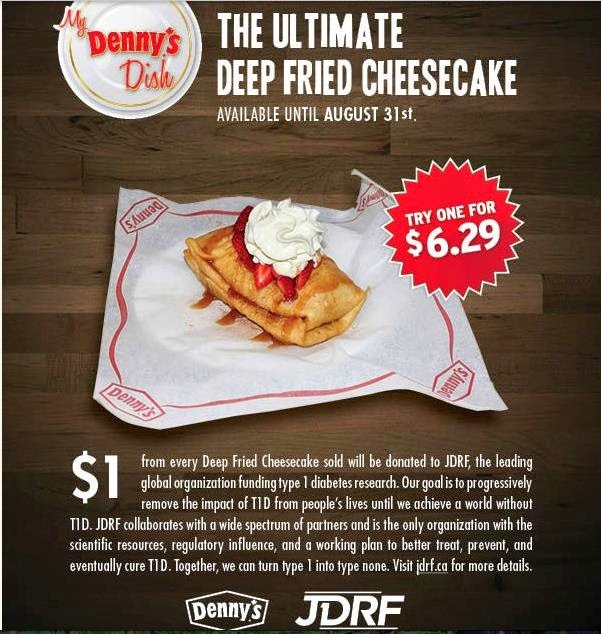 "$1 from every Deep Fried Cheesecake sold will be donated to the JDRF, the leading global organization funding type 1 diabetes research. Our goal is to progressively remove the impact of T1D from people's lives until we achieve a world without T1D". The JDRF may be hoping for a world without type 1 diabetes, but clearly not one without type 2 diabetes given their promotion here of heading to Denny's in the first place let alone consuming Deep Fried Cheesecake, or in the past when the JDRF promoted the consumption of a "Mega-Jug" of Pepsi at KFC. And no, this is not a joke or a photoshop.